Americans who once earned family-supporting wages working in factories, foundries and mills across this country began destroying themselves at a shocking rate five years after implementation of the North American Free Trade Agreement (NAFTA). That’s because such deals – schemes exactly like the proposed Trans-Pacific Partnership (TPP) trade agreement released last week – encouraged corporations to offshore manufacturing, decimating decent American jobs and the lives of decent American workers. Unemployed, desperate and despairing, these once-middle-class workers are killing themselves at unconscionable rates with guns, heroin and alcohol-induced cirrhosis. To such workers, the TPP would mean more tragedy, more death. The opposite is true for CEOs, shareholders and Wall Street financiers. To them, the TPP would mean even more luxury, more wealth. Trade schemes like the TPP further rig the economy in favor of the already-rich and against the hard-working rest. Purple dashed line shows rising death rate for white men aged 45 to 54 with high school diplomas or less education. 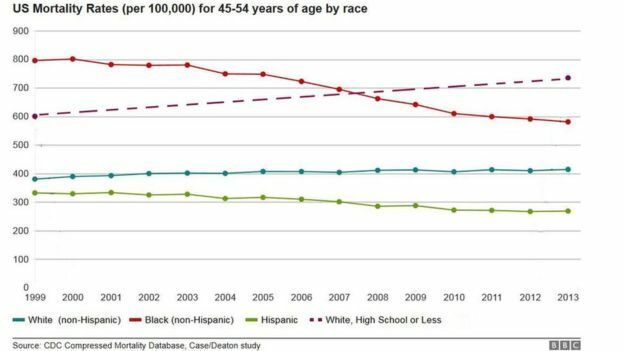 Red line is black mortality rate for same age group; green line is Hispanic; teal is caucasian. Two Princeton economists last week published a study showing that white, middle-aged Americans with high school diplomas or less education are dying at a faster rate than they did before NAFTA. They began suffering diminished life expectancy in 1999. That stands in stark contrast to all other age and ethnic groups, including African Americans, Hispanic Americans and Europeans, whose health and life expectancy have improved. The typical killers, diabetes and heart disease, didn’t take these white Americans aged 45 to 54. It was suicide, drug overdoses and alcohol abuse. Before 1999, the mortality rate for this group, as for the others, had been declining. Since then, their rising rate means, “half a million people are dead who should not be dead,” said study co-author Angus Deaton, a 2015 Nobel Prize winner. That is close to the number of Americans killed by HIV-AIDS. Unlike AIDS, this has been a silent epidemic, unexposed until the report by Deaton and co-author Anne Case. The cause of the self-slaughter, the researchers suggested, is financial strain. Bread winners couldn’t pay their bills and couldn’t foresee a future when they could. That is because jobs in manufacturing and construction – jobs that had provided middle-class incomes for workers without college degrees for decades – disappeared. Between 1997, three years after NAFTA took effect, and 2014, the country lost more than 5 million manufacturing jobs. The vast majority, according to the Economic Policy Institute, vanished as a result of growing trade deficits with countries that the United States signed so-called free trade and investment deals with. Just since 2001, 56,000 American factories closed. Corporations moved many of these to low-wage, low-worker-safety, low-environmental-protection countries with which the United States has so-called free trade deals enabling the companies to sell the foreign-made products in America with little or no tariffs or duties. The TPP, the largest so-called free trade deal ever, encompassing a dozen Pacific-Rim countries including forced and child labor violators Brunei and Vietnam, would send even more American industry and jobs overseas. The Wall Street Journal calculated that the TPP would increase the U.S. trade deficit in manufacturing, car assembly and car parts by $55.8 billion a year by 2025. Using the U.S. Department of Commerce estimate of 6,000 jobs lost for every $1 billion in trade deficits, the TPP would cost another 330,000 American manufacturing workers their jobs, their income, their hopes. Maybe their lives. That 330,000 probably is a low-ball estimate because the TPP negotiators secured no enforceable protections for American workers. For example, the TPP would provide no way to compel partner countries to stop manipulating their currencies to gain competitive advantage over American manufacturers. Countries like Japan, Singapore and Malaysia, all TPP partners, lower the value of their currencies to make their exports cheaper in the American market and American exports to theirs more expensive. Ford Motor Co. opposes the TPP for this reason. Similarly, the TPP fails to include enforceable methods to stop foreign labor abuses including poverty wages and violations of collective bargaining rights. This facilitates the race to the bottom on wages. Corporations move factories overseas because they can’t get away with paying Americans the 90 cents an hour that is the average wage in Vietnam. Also, disastrously, the TPP would lower the content requirement for cars and auto parts to be considered produced in a TPP country. NAFTA set the figure at 62.5 percent for cars. That meant 37.5 percent of a car could be manufactured in China, shipped to Mexico for assembly and the car deemed made in Mexico for tariff purposes. The TPP would reduce the domestic content percentage to 45, so that 55 percent of a vehicle – more than half – could be manufactured in China and the car still considered made in a TPP country and benefit from zero tariffs when shipped to the United States. In addition, the TPP’s proposal to immediately eliminate U.S. tariffs but allow TPP partners to sustain theirs for years would lure U.S. factories offshore. That’s because it means corporations would have to pay tariffs to ship American-made goods to TPP partners, but they would pay none if they move manufacturing to a TPP country and export to the United States. Another way the TPP would send American work overseas is by ending the Buy American preference. The trade deal would allow any TPP partner to bid on federal contracts, so American tax dollars would be spent to create jobs in TPP countries like Mexico and Malaysia instead of in the United States. Literally hundreds of lobbyists were given a seat at the secret TPP negotiating table, resulting in these rules favoring multi-national corporations. For decades, the regulations for international commerce, for so-called free trade, have lined the pockets of the already wealthy and emptied those of workers thrown out of their jobs. It was cruel enough that America countenanced for decades so-called free trade that cost millions of U.S. manufacturing workers their source of family-supporting income. But now that it’s clear that bad trade schemes also cost workers their lives, the TPP must be stopped. It cannot be permitted to kill more Americans who want so desperately to work.